A fascinating trek in the company of pilgrims to the source of the Ganges in the "Cow's mouth" at the foot of an ice wall. Trek on to the superb high meadow at Tapovan with its immaculate views of surrounding high Bhagirathi peaks, including superb Shivaling. 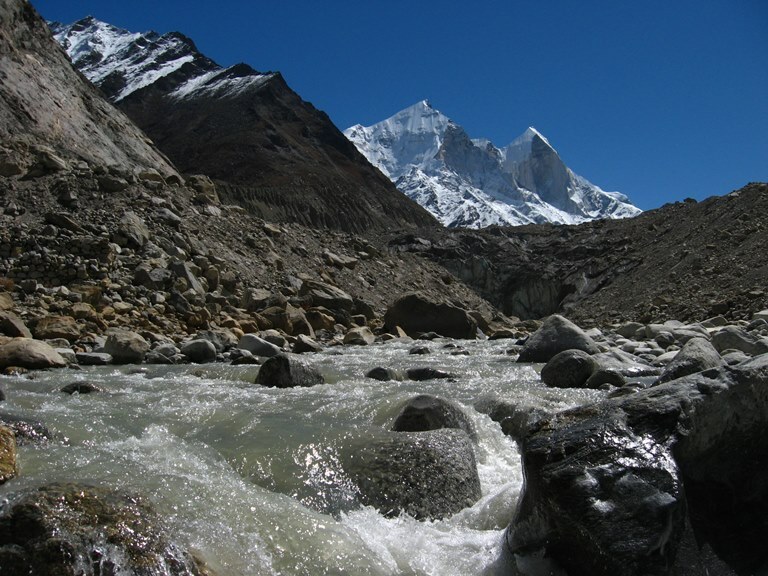 You can go further on to cross the vast Gangotri Glacier. A hugely atmospheric walk, providing an insight into Hindu culture and beliefs. Tough walking (tackling terminal moraine in places) in remote mountains, where altitude can cause real problems. Come fully prepared, including proper acclimatization. This fascinating and beautiful combination of walking experiences is hard to name and explain ("Source of the Ganges" would undersell it), in part because of the variety of options available. These days will be brilliant for people watching and a full immersion in Hindu culture and beliefs: given The Ganges' importance in Hindu traditions ( it is beyond merely a river, a spiritual source and healer), huge numbers of pilgrims make their way here from all over India. But don't expect splendid isolation and don't get depressed at the stalls and mess along the route. The valley opens up for the first big views of the high peaks surrounding ite head near Chirbasa, where you will likely camp by the river. The trail to Bhojbasa (at 3,790m) is a mere 5 km, allowing for acclimatization, and beautiful, with outstanding mountains all around. Day 3: The final 2.5 hr ascent to the Cow's Mouth is hard in places, but even the most cynical atheist will be moved by the approach to this degraded but numinous place. Beyond Gaumukh, you are (relatively) on your own, on minor paths as you ascend across rough ground (often terminal moraine) to the superb high meadow at Tapovan (4,450m) by the vast Gangotri Glacier, with its immaculate views of surrounding high Bhagirathi peaks, including the magnificent cones of 6,543m Shivaling, claimed with justice to be one of the world's most beautiful mountains. Tapovan is itself a pilgrimage site for some. Tapovan is a perfect base for day walks in this wonderful glacier confluence surrounded by huge mountains. You can walk to Kirti Bamak glacier, for views of Kedardohme (6,850m), Kirti Bamak and Shivaling. And a walk to Meru Glacier to view Mount Meru is also hugely rewarding. 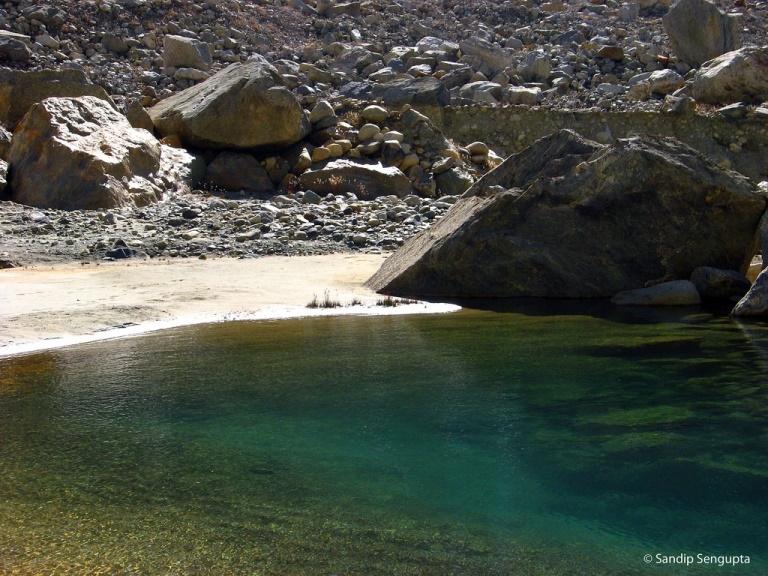 You can get back to Gangotri in a day and a half, or you can go yet further on, to cross the Gangotri Glacier (in up to 4 hrs: take an experienced guide) to camp at Nandanban between the Gangotri and Chaturangi glaciers, returning to Gaumukh the next day. From Nandanban you can walk to Vasuki Tal, a superbly sited lake below Mounts Satopanth and Vasuki Parbat, the first step on the Khalindi Khal Pass trek (see below). From Nandanban you can head east up the Chaturangi Glacier and over the Kalindi Khal Pass (5,968m) to the pilgrimage centre at Badrinath. A week or so. 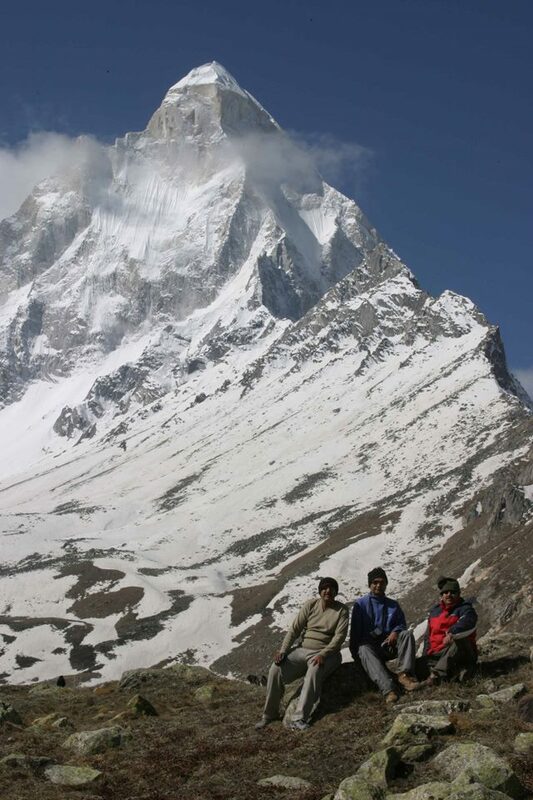 Said to be one of the Gharwal's greatest treks - but, with the high pass at nearly 20,000ft, this is ultra-demanding. 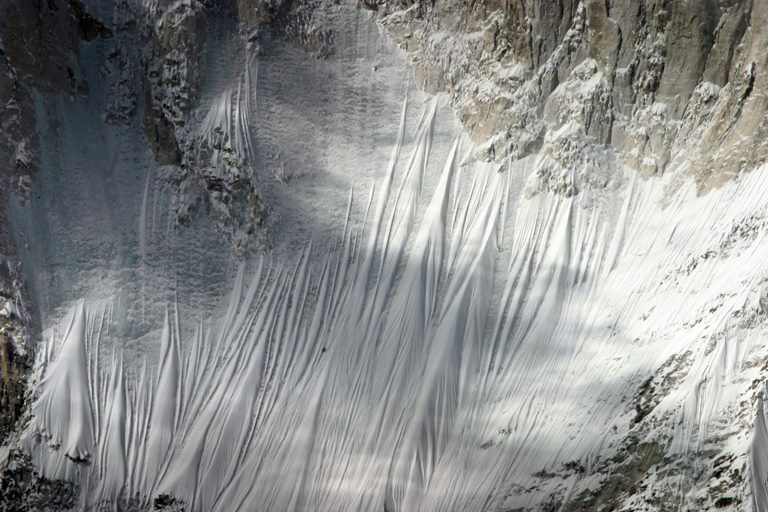 Or Trek south from Gangotri over Auden's Col (5,400m) between Gangotri III and Jogin I peaks, crossing glaciers on the way up and back down (this the vast Khatling Glacier) on a tough but immensely rewarding trek to the Kedar Valley. 10 days or so. Wildlife includes ibex and in theory show leopard. Briefish section in Lonely Planet's Trekking in the Indian Himalaya. Chapter in Trekking and Climbing in the Indian Himalaya. Best in mid Sept to mid Oct, although May to June is also done.